High resolution Chinese phone due in March? Chinese electronics maker Oppo was more than happy in December to confirm that its Find 7 smartphone will sport a 2K resolution display, but now it seems like there may be a standard HD version in the works as well. After all, QHD 2K screens pack a lot of pixels in - 2,560 x 1,440, to be precise - and the benefit to consumers has yet to be demonstrated. Having a cheaper version with a 1080p display sure makes a lot of sense. Now Oppo has posted on the Chinese social and blogging network Weibo saying that Finds are coming - "are," not "is," as CNET points out. And the site claims that a benchmark test leak in early February pegged the Oppo Find 7 with a 1080p display - curious, since we know that it actually has a 2K screen. Either clue might be an error or a mistake in phrasing, but combined they could point to something; a 1080p Find 7 being released in addition to the 2K Find 7. 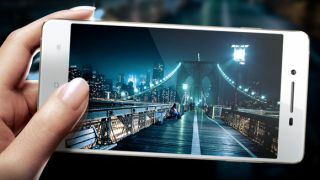 Oppo may not want to bet all in on 2K screen tech for its next flagship, and having two SKUs would allow it to cover multiple price points while still nailing the high-res wow factor. Besides this speculation about the display, little else is know about the Find 7, but it's expected to debut at 798 Art Zone in Beijing on March 19. Oppo is far from the only company gearing up for the 2K phone race, though. Samsung confirmed in January that it's working on not only 2K smartphone displays, but absurdly dense 4K smartphone screens as well. In fact the upcoming Galaxy S5 may be the company's first QHD phone. Back in December even Apple was rumored to be testing 2K and 4K resolution iPads as well. Still, it remains to be seen how many pixels is too many. Here's our review of the Samsung Galaxy Note 3.